This book considers the United Nations High Commissioner for Refugees’ contribution to international refugee law since the establishment of UNHCR by the United Nations General Assembly in 1951. The book explores the historical and statutory foundations that create an indelible link between UNHCR and international refugee law. This book charts the significant evolution that has occurred in the organisation’s role throughout the last sixty years, looking at both the formal means by which UNHCR’s mandate may be modified, and the techniques UNHCR has used to facilitate the changes in its role, thereby revealing a significant evolution in the organisation’s role since the onset of the crisis in refugee protection in the 1980’s. UNHCR, itself, has demonstrated its organizational autonomy as the primary agent for the adaptation of its responsibilities and work related to international refugee law. The author does suggest however that UNHCR needs to continue to extend and strengthen its role related to international refugee law if UNHCR is to ensure a stronger legal framework for the protection of refugees as well as a fuller respect for refugees’ rights in practice. UNHCR and International Refugee Law should be of particular interest to refugee lawyers as well as academics and students of refugee law and international law, and anyone concerned with the important role that UNHCR plays in the protection of refugees today. 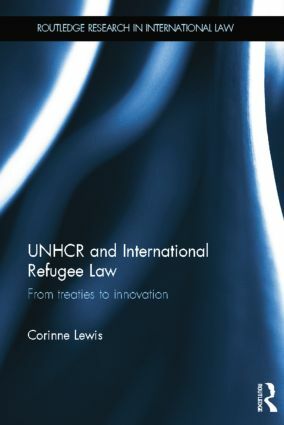 Corinne Lewis has drawn upon her decade of experience as a Legal Officer with UNHCR and her human rights and refugee law research to explore UNHCR’s contribution to the development and effectiveness of international refugee law. She has taught courses on human rights, refugee law, and international organisations law, as well as the United Nations and brings these areas together in this book.